We were invited to ex-QVC host Lisa Mason’s “Laura and Lisa on Lex” event in Manhattan Saturday, but we had a boatload of work to do and just couldn’t make it. The event included Mason signing her new book, “Big Life Lessons From That Still, Small Voice,” at Barnes & Noble and then heading off to QVC vendor and makeup wizard Laura Geller’s Big Apple studio. The shindig was a big success, as we can tell from Mason’s post on her blog. Former QVC host and newly minted author Lisa Mason has been quite the busy beaver. She had nailed down several additional book-signing events at Barnes and Noble for her tome, “Big Life Lessons From That Still Small Voice.” And she is touting her availability as a speaker. Mason is not not only doing a “Lisa and Laura on Lexington” event April 9 with QVC vendor and make-up maven Laura Geller, she’s got B&N events nailed down in three more towns, according to her blog. Pittsburgh, Pa., April 16, 11 a.m. to 2 p.m, 800 Settler’s Ridge Center Drive. Exton, Pa., April 30, 11:30 am. to 1:30 p.m., Exton Town Center. Greensboro, N.C.: May 7, 2 p.m. to 4 p.m., 3102 N. Line Ave.
And there’s a special deal for the Pittsburgh event. We came in on the tail end of Patti Reilly’s final show on QVC, and she has wiped tears from her eyes several times as we were watching. She is going to need a truck to take home all the bouquets of flowers she’s gotten during her swan song. She is now on the air with makeup queen Laura Geller, who she described as her best friend. The show is about to end. “I’ve been crying here all night,” Geller told Reilly. That’s what a lot of people are wondering. On Facebook a few days ago, Reilly seemed a little annoyed that fans keep asking why she is going. She posted her answer Monday. At the very end of Reilly’s last QVC show, hosts Lisa Robertson and Jacque Gonzales came out — and also got weepy –to say goodbye. Gonzales blubbered something about Reilly coming to her wedding that we didn’t quote catch. “Thank you everybody, for watching me for 11 years,” Reilly said. Ever-bubbly Mally Roncal, the red-carpet makeup artist, was also on Reilly’s final “Friday Night Beauty” show. In fact, Roncal created two products, a Highshine Liquid Lipstick Duo, just for Reilly. Geller, by the way, has now lost two of her good buddies at QVC. 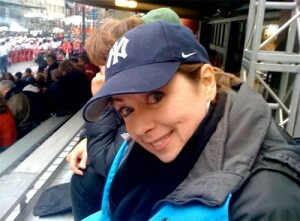 Host Lisa Mason, Geller neighbor in Manhattan, also exited this year. In fact, Mason and Geller are doing a meet-and-greet in Manhattan to promote Mason’s new book. We’ve said it before and we’ll say it again: People seem to love or hate Patti. QVC customers are bantering back and forth on our blogs about her, which mentioned the fact that she had lost a lot of weight vey quickly, making some suspect she had some kind of surgery. QVC will be back in Cali this weekend for the second year in a row to ride the red-carpet coattails of the Oscars. There will be two live broadcasts, this Friday at 9 p.m. (ET) and Saturday at 8 p.m. (ET). During the shindig at the Four Seasons Hotel Los Angeles at Beverly Hills, “Gossip Girl” actress Kelly Rutherford will finally debut her luxury handbag line during the Saturday broadcast. Fashion designers including Isaac Mizrahi, Dennis Basso and Marc Bouwer are scheduled to appear during the broadcasts along with Lori Goldstein, the Kardashians and Melania Trump. Actor Matthew McConaughy’s girlfriend (and mother of his child) Camila Alves and costume designer Janie Bryant, of “Mad Men,” will also present their latest collections. They will join some of the best in the beauty business including Kate Somerville, Josie Maran, Laura Geller, Smashbox and Tarte, among others, will be on hand. QVC.com will host a special online preview of the event now through Friday. Lisa Mason fans, “Laura and Lisa on Lex” is a go on April 9. And Gino will be there. Former QVC host Mason posted on her blog that she and QVC vendor/makeup diva Laura Geller will be meeting with friends and fans in the Big Apple. Mason it touting her new book, “Big Life Lessons From That Still, Small Voice.” Mason and Geller are neighbors in Manhattan. “We start at 10:30 at B and N (Barnes & Noble) on Lex with coffee and talk and books,” Mason blogged. Mason is asking that those who want to make the trek RSVP. Anyone who watched Mason on QVC often heard her talk about her husband, Gino. He is just turning 50, according to Mason. So far, Mason is doing well with her book. She basically sold out 2,000 signed copies. You can also order it at www.bbotw.com. Want To Join Ex-QVC Host Lisa Mason and Laura Geller On Lexington? Want to hang out with ex-QVC host Lisa Mason and current QVC vendor/makeup maven Laura Geller in the Big Apple? Then keep March 5 (our dad’s birthday) open. “We would start at the Lexington and 86th street Barnes and Noble for a time of getting caught up with each other. Bring your gal pal and I will bring mine…. Laura Geller!! I would read from the new book and sign a copy or two, if you were interested. Then, we would head a few blocks south on Lexington to Laura Geller’s makeup studio and continue the fun. We could laugh, chat and put on makeup. Laura would probably have some awesome deals for us, as well. Here is the deal… Barnes and Noble can only hold about 130 people at a time in one location. So, how do you feel about an rsvp? Laura and I are thinking about a Saturday afternoon starting at around 1 ish and ending at around 5 ish. That way, if you are going to a show or just out to dinner, your makeup would be done. On Groundhog Day (our mom’s birthday), Mason posted on her blog that the tentative date for the girls’ thang is March 5. She also wrote that her book from Infinity Publishing will be available Feb. 7 for $10.95. But don’t expect the tome, “Big Life Lessons From That Still, Small Voice,” to be all sunshine and flowers. First, please know that this is not a “isn’t life grand! !” book. It is a painfully honest text and expresses how difficult my life has been at times. One chapter was very, very difficult to write as it tells the story of my badly I treated someone and how I have never really gotten over it. If you want a book about a person who has no troubles and no regrets, well, this is not for you. Sounds like a real laugh fest. We almost started tearing up ourselves as we watched longtime QVC host Lisa Mason do her emotional final show — Diamonique, fittingly — on QVC Tuesday evening. Mason also did the big reveal about her plans: She has written a book about God called “Big Life Lessons From That Still, Small Voice.” More on that later. Ms. Mason got choked up and was literally speechless twice during her two-hour show: For a few moments when her fellow host, Jacque Gonzales, called in on-air to say goodbye, and when makeup vendor Laura Geller called in at the show’s finale. Mason, clutching a tissue, couldn’t get a word out when Gonzales called in. There was a long silence until Mason composed herself and Gonzales spoke up. “You are my mentor, and took me by the hand day by day and step by step,” Gonzales, tearful herself, told Mason. Gonzales threatened to hop on a train to Manhattan and stalk Mason in her Upper East Side neighborhood. “I love you,” Gonzales said. “I love you too, sugar,” Southern belle Mason replied back. Later on, Mason joked about her temporary loss of words. “Was it an awkward moment of silence?” she asked. Only if someone doesn’t have a heart, Lisa. Then near the end of the show, Geller called in and Mason just put both her hands up on her face, covering her eyes, and didn’t say a word, she was so emotional. Geller spoke up and filled up the dead air, singing praise for Mason until the beloved host was able to speak. “Stop crying, wipe those tears already,” Geller told her. They apparently see a lot of each other, since Geller lives on 68th Street in the Big Apple and Mason and her husband Gino are on 76th. “Girl, did you see I lost it?” Mason told fellow host Jane Treacy later in the show, referring to her emotional reaction when Geller called in. Mason got weepy more than once, not just with Gonzales and Geller. There were plenty of other call-ins, including former QVC host Kathy Levine, skin care vendor Dr. Adrienne Denese, makeup vendor Mally Roncal, designer Louis Dell’Olio, Affinity Diamond expert Michael O’Connor and Chaz Dean. QVC also aired clips of QVC hosts Dan Wheeler, Jayne Brown and Leah Williams saying their goodbyes to Mason. Mason, who joined QVC in 1995, also offered a bit of advice to viewers. “Find a way to bring happiness to your life,” she said. Amen to that! QVC did Mason a kindness by flashing the home page for her new website, lisamason.org. We tried to get on the site after the show, but it was down. Maybe it crashed from the traffic from her fans. Finally, Mason briefly talked about her book. For astrology buffs, Mason is a Capricorn born Dec. 28, which is also her wedding anniversary with Gino. QVC has landed another high-end makeup vendor to its lineup, Nars. The cosmetics line will debut on QVC Wednesday at 8 p.m. It is one of many high-profile makeup brands that QVC has brought on board to broaden its product mix, names like Bobbi Brown, Laura Geller, Smashbox and the popular Bare Escentuals. Here is the network’s spin on Nars. “Chic, sophisticated and timeless with a twist, Nars is the beauty brand for the modern, independent woman. At the heart of this iconic brand is creator François Nars’ philosophy: there are no rules when it comes to beauty; whatever makes you look and feel good is right,” says QVC’s web site. “From his early days as a student at the Carita Makeup School in Paris to his work in New York with fashion’s top publications, François Nars has helped to transform the face of beauty. His distinct aesthetic is evident throughout the entire Nars collection and in all of Nars’ advertising campaigns, which François photographs himself,” so we are told. Let’s see if it becomes the choice of Homeshoppingistas. You are currently browsing the archives for the Laura Geller category.